Want to let your family know how much they mean to you? 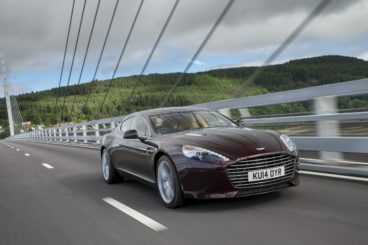 The new Aston Martin Rapide S Saloon is one of the most exciting family cars on the planet. It gets you and your loved ones around at an incredible pace while always feeling relaxed, and its cabin feels super special. It doesn’t hit as hard as meatier rivals; instead, it offers extraordinary levels of comfort and luxury. That said, it also comes with a massive price tag and high running costs. Are the likes of the plush polished metal grille and the 552bhp engine worth it? OSV takes a closer look at our 2018 Aston Martin Rapide S Saloon review. This is an Aston Martin, so whatever attempts the brand has made to make the Rapide S Saloon a relaxing place to be, buyers will always expect a degree of sportiness. It does well to mix the two. It’s a huge car, but it’s yet another testament to the brands remarkable engineering that it’s so agile on the move. It handles like a smaller car, it corners well at speed, and the steering is precise, well-weighted and offers lots of communication. On the other hand, it emits a bit of kickback, but it’s not really an issue. The car comes with three-stage active dampers, which smooths out poor road surfaces, but the chassis always feels taut and firm. The brakes are strong and progressive, while the traction control comes with various modes that are well worth diving into. Drivers can turn it off or leave it on, but because the car is so heavy and long, it’s a feature well worth leaving on. In terms of its engine, there’s just the one available. It’s a 5dr Rapide S 6.0-litre V12 petrol engine that develops a thunderous 550bhp. That’s enough to get you from a standstill to 62mph in 4.4 seconds, and if you go for the Shadow Edition, you can top the power up to 573bhp. Top speed is 203mph, which makes it all the more surprising that the Aston Martin feels so alive even at lower speeds. This means that you can still have bags of fun without running the risk of losing your license. The Rapide S comes paired up with an 8-speed Touchtronic III automatic transmission that makes near-instant gear changes, and it’s the same gearbox used in the svelte Aston Martin Vanquish. Press the Sport mode button and you can sharpen it up, and you can even take control of it using the column-mounted panels. This is ideal for drivers who’d prefer a manual ‘box. Traffic-stopping looks are the order of the day on the outside, while inside the Aston Martin is a very special place. It’s suave, comfortable and feels and looks expensive. 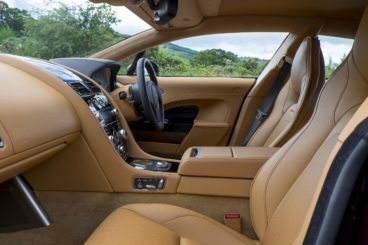 All the traditional Aston Martin cues are present and correct, from the massive centre console to the unique instruments to the lashings of leather and wood trim. It’s indulgent, beautiful, beguiling stuff. Not that it escapes criticism, however. The infotainment system displays its graphics on a super small, colourless screen if you avoid the sat-nav. It looks a bit dated, but a recent refresh means the Rapide S now gets dual tone leather seats for extra swankiness. There are more interior colours to choose from now too, with a recent addition including Fandango Pink. Buyers can also contrast interior colours if they so wish as well. 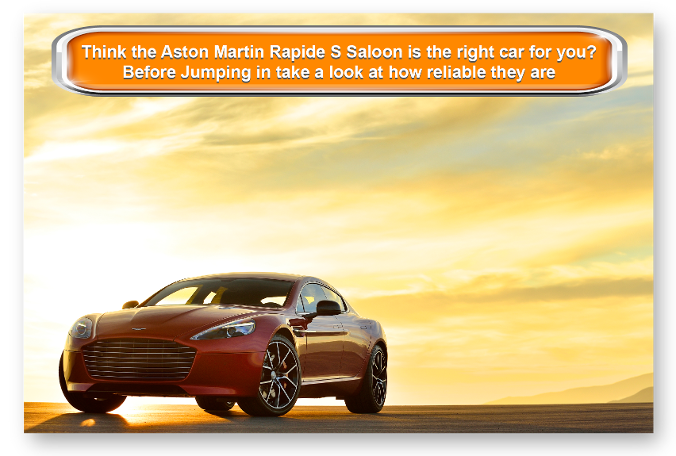 Is the Aston Martin Rapide S Saloon practical? Compared to mainstream hatchback’s, we’d have to say that it is and it isn’t. Its boot measures 317-litres, but rear seat space is a bit cramped. In fact, the rear seats aren’t any bigger than those you’ll find in a supermini. Compare the car with 2+2 coupes, on the other hand, and it compares favourably. Moreover, the fact that the rear seats are tailored and fold forwards with ease is a huge tick in the box. Equipment levels are good, with all models getting the likes of traction control, remote locking, Bluetooth, sat-nav, metallic paint, leather seat trim, body coloured bumpers, alloys, electric seats, electric mirrors, heated seats and headlight washers as standard. The most expensive models get folding rear seats, rear electric windows, a TV and sports seats, while options include rear seat entertainment. In terms of how safe it is, there are always going to be one or two concerns with cars that can do 203mph. The Rapide S Saloon hasn’t been crash tested by Euro NCAP, but it comes with a reassuringly strong aluminium structure, while its standard safety kit includes electronic stability control, rear parking sensors, climate control and ABS. Prices for the new car start out from £149,500. If you prefer to lease, you can pick up a deal from around £2,436 + VAT per month. For more information on our leasing deals, check out our page here. In terms of its running costs, there aren’t really any positives. This is a powerful, luxurious machine that’s backed up by a seismic 6.0-litre V12 engine. The best it can return is 21.3mpg, which is one of the worst in this class. Meanwhile, it emits as much as 330g/km of CO2, which means you’ll be landed with a £505 tax bill each year. As expected, it’s as suave as they come. Its mighty 6.0-litre V12 engine develops a crushing 550bhp. Enough said! It handles like a sports car. Expect that £150,000 price tag to plummet to around £70,000 after just three years. At 317-litres, its boot won’t compare well to a lot of its rivals, while rear seat space is cramped. Let’s see how the car fares against its rivals in the comparison section of our 2018 Aston Martin Rapide S Saloon review. 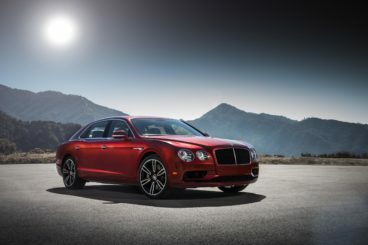 The new Bentley Flying Spur Saloon is luxurious and very, very fast. It’s pure magic. In fact, it’s the fastest car of its type (a four-door saloon) that Bentley has ever put together. It also handles superbly, despite its obvious hefty size (it weighs 2.5 tonnes). The soft suspension ensures you don’t feel nasty lumps and bumps in the road, while its re-tuned air suspension helps to reduce body lean. All models come with four-wheel-drive, a system that delivers the cars titanic power to good effect. It’s a sporty system that sends the majority of the Bentley’s power to its rear wheels. In terms of the engines, a twin-turbocharged V8 petrol kicks things off. It develops 500bhp, which is enough to haul the car from rest to 62mph in 5.2 seconds. That’s quick and the V8’s signature noise is all present and correct. However, those who need more power and pace and have suitably deep pockets will prefer to take a look at the monstrous 6.0-litre W12 petrol engine. It develops 616bhp if you stick to the “standard” model and 626bhp if you upgrade to the S model. 0-62 is dispensed within 4.5 seconds, max speed is 200mph and there’s drama all the way. The real problems start when you take a look at running costs and emissions. The W12 in standard or S guise emits a whopping 343g/km of CO2 into the atmosphere and, despite the addition of cylinder deactivation technology, it’s unlikely to return over the 20mpg economy. The V8 engine, meanwhile, emits 254/km of CO2 while returning 25.9mpg. Inside, one of Bentley’s best qualities is its high levels of comfort. Even on rougher roads it rides well, while a full-length acoustic shield serves to make the Flying Spur one of the quietest cars in the world. There are four seats inside, all of which offer premium space and comfort, while the dash gets sports piano black wood veneer and the cabin gets upholstered leather seats, dark tinted lights and door mirror casings if you go for the Black Edition. Is the Bentley Flying Spur Saloon practical? Its boot measures an impressive 475-litres, while head, leg and shoulder room is good for all. Like the Aston Martin, it won’t be crash tested by Euro NCAP. However, anti-lock brakes, electronic stability control and ABS are all included in its standard safety it. The new Mercedes-Benz S Class Saloon is hard to beat as far as luxury saloons go, but can it tempt you away from an Aston Martin? On the road, the S-Class is smooth, refined and comfortable. It’s absolutely gorgeous, but if you want more ferocity you can upgrade to the fearsome AMG versions. Historically, however, we’ve associated serenity with the Mercedes S Class and that’s what buyers will continue to appreciate in 2018. It doesn’t entertain in bends as much as the Rapide S Saloon, but it never has done and probably never will do. There’s plenty of grip on offer, body lean is well managed, while the brands Magic Body Control ensures that its levels of comfort is on par with even a Rolls Royce. In terms of its engines, if you don’t want an AMG model you’ve got the option of a plug-in hybrid. This S500e model combines an electric motor with a 3.0-litre petrol engine for a good turn of speed, and it can operate for 30 miles on just electric power. The S63 model kicks off the AMG range. Powered by a brand new 4.0-litre V8 engine, its engine is actually smaller than the twin-turbo 5.5-litre unit it replaces, but it develops 604bhp, which is almost 30bhp more than its predecessor. 0-62 is dispatched in 4.3 seconds, which makes it even faster than the bigger S65 model. This S-Class is powered by a 6.0-litre twin-turbo V12 engine that gets a longer wheelbase, develops 621bhp, and does 0-62 in 4.7 seconds. 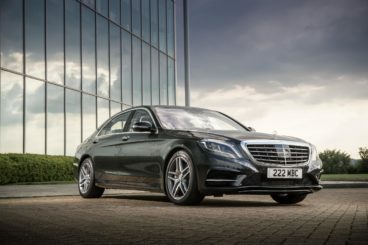 Running costs aren’t pretty for the petrol engines, but Mercedes claims their S500e plug-in hybrid model can return as much as 100.9mpg economy while emitting as little as 65g/km of CO2. The S63, meanwhile, is good for 32.1mpg at best, which is at least better than the Aston Martin, but the bulldozing S65 model can only average 23mpg. Inside, the Mercedes-Benz S Class Saloon is first class. It combines advanced technology with a stunning design and is easily one of the best places to spend your time on the road. Insulation is magnificent and you’ll barely hear a peep from outside the car. A pair of 12.3” TFT screens replace the usual infotainment screens, while voice control is standard as is soft leather upholstery, brushed aluminium and wood veneer. Is it a practical car? It’s huge and we can’t see anyone complaining about the space on offer. It’s a real luxury limo that gives you ample room to stretch out. If you do need regal levels of space, it’s well worth going for the longer wheelbase model, but even the shorter one should suffice. The bro, meanwhile, measures 500-litres if you stick to the short wheelbase model, 530-litres if you opt for the longer wheelbase and 395-litres if you go for the hybrid. The Rapide S is meant to be one of Aston Martin’s most practical cars. It is but it still compares unfavourably in that aspect to a lot of its rivals. The thing is that it’s got hatchback practicality while its competitors have gone for saloon practicality. However, if you’re happy with a 317-litre boot, the Aston Martin Rapide S Saloon is all guns blazing in every other area, from pace, power and performance to sophistication, style and luxury.